Director Howard Hawks was notable for his popular successes over a long career and across almost all film genres. Though he was championed by both French New Wave critics and by Andrew Sarris, Hawks’s so-called “no-nonsense” style often seems merely conventional, and in fact many of his lesser films are distinctly run-of-the-mill. So his status as one of the preeminent film auteurs remains somewhat enigmatic. 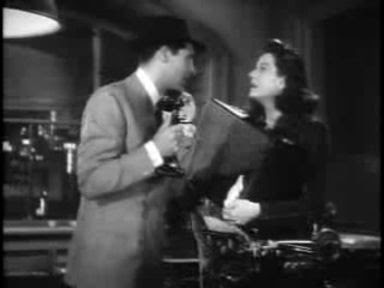 One of his most enduringly popular films, the comedy His Girl Friday (1940), is exemplary of some of these contradictions. 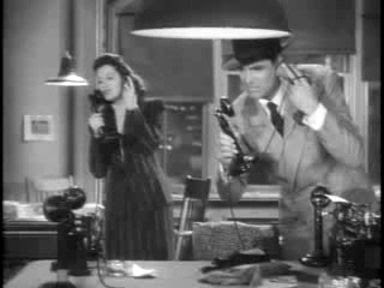 The story of His Girl Friday was based on the popular Broadway play, The Front Page (1928), by Ben Hecht and Charles MacArthur, which had been successfully filmed in 1931 by Lewis Milestone and was reprised in 1974 by Billy Wilder. The single set for that original play was the Press Room near Chicago’s Criminal Courts building and jail. 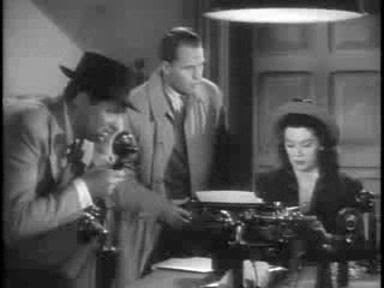 The plot describes how a Chicago newspaper reporter, Hildy Johnson, enters the pressroom announcing to his colleagues his intended retirement from journalism but is immediately lured back into the exciting world of journalistic scooping by an improbable series of events involving murder, a jailbreak, and corrupt politics. Hawks’s film version, which starred Cary Grant, Rosalind Russell and Ralph Bellamy, suffers from a number of immediately apparent deficiencies, and yet it clearly surpasses the Milestone and Wilder versions and ranks among the most popular movies ever. The reasons for that may be due to Hawks, or perhaps simply to some good fortune of alternate casting. The film is very stagy, focused as it is on basically two locations, the newsroom of the Chicago Morning Star newspaper and the Chicago courthouse pressroom. The camera setups are conventional and relatively flat, with mostly constant-distance shots. The plot features ridiculously improbable events that go beyond all limits of plausibility. The acting is so tongue-in-cheek and smirky that one feels that many of the players are not taking their roles seriously. It all appears to be something of put-on. Cary Grant is particularly guilty here, but he manages to pull it off, because, well, he’s Cary Grant. And yet despite these drawbacks, the film succeeds. Why? One of the attractions can be associated with Hawks’s characteristic focus on male “gang” camaraderie and bonding that underpins the action. This always played to good effect in his war films and gangster films. Here, it is the group-loyalty of the Chicago press corps that Hawks accentuates. And after all, that is the key seduction that lures both Hildy Johnson (Rosalind Russell) and her editor boss, Walter Burns (Car y Grant). A second positive feature of this film is the accentuated overlapping dialogue that intensifies the pace of the excited journalists chasing down the story. This broke with conventions in the sound era that tried to ensure that dialogue was distinct and clearly heard. In this case, some of the repartee involves people talking over each other, with one person starting up before another is finished. Hawks ensured that the dialogue was written so that even when the beginnings and endings of sentences might be lost in the noise, the dialogue could still be understood. 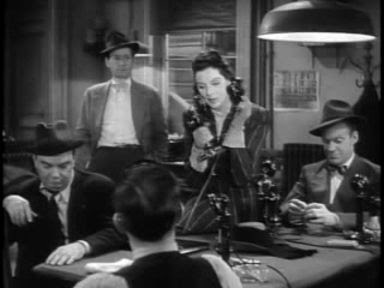 A third, essentially crucial, feature of His Girl Friday, was Hawks’s decision to cast the role of Hildy Johnson as a woman, instead of the male casting for that role in the original play. This added an interesting gender-conflict feature to the journalism story, as well as contributing an underlying and parallel romantic element. But the most crucial feature of all to what makes the film a success is not due to Hawks; it is in spite of him. It is Rosalind Russell’s magnetic performance as Hildy Johnson that is the driving force behind the film’s success. Yet she was at least Hawsks’s ninth-choice for that role, after a number of leading actresses had all turned Hawks do wn for the part. But Russell proved to the key ingredient. Since Hawks allowed some ad-libbing on the set, Russell took advantage and filled out her role during the shooting. She later confessed that she even hired a writer to provide lines that could help her beef up her role. Ultimately, this is Rosalind Russell’s film. She had the electricity, charm, and feminine magic to make the audience overlook all the cracks and corny inadequacies of the story and staging. And Hawks, at least, deserves the credit for finally giving her the space to do it.